Since the start of July, EMD assets have bounced with local and dollar debt markets up around 2% and some countries’ markets rallying closer to 10%. The positive returns reflect the still solid fundamentals across most of EM and the extent of the sell-off in Q2 reinvigorating value into the asset class. While most markets have rallied in recent weeks, Turkey has been the noticeable exception – it is the only country to have a material negative return. In this blog post we outline the reasons for this latest sell-off in Turkish assets and examine the various paths ahead for the country. Turkish underperformance in recent weeks is starkly revealed in Chart 1 – which shows that 16 of the 18 markets have had a positive return since start of July, while Turkey has returned close to -19%. Indeed, year to date Turkish local markets are down close to 40%. The lira has broken well above 5 (after starting the year below 3.50) and local bonds are now trading at yields above some frontier markets (Chart 2). Dollar-denominated debt has also been hit, particularly on the corporate side given the impact of FX depreciation on Turkish corporate balance sheets (with the banking sector most impacted). Thus, the JP Morgan CEMBI Turkey Index spread has doubled in 3 months from 350 in April to above 700 now. The drivers of recent weakness have been the same drivers that have weighed on the country’s markets over the medium term; namely a lack of credibility at the central bank, an unwillingness or inability to address external vulnerabilities and, related to both these points, a troubling political backdrop of heterodox macro policy and increasing authoritarianism. Since Erdogan’s election victory in June, there have been several moves that have rattled investors. Several bureaucratic changes were made including, changing the rules to make the central bank governor a political appointee. Moreover, the appointment of his son-in-law (and potential successor), Berat to head up the finance and treasury ministry. Relations with the US have also worsened in recent weeks to the point that two senior Turkish officials were sanctioned over the detention of a US pastor. While of no direct economic impact, it speaks to the ongoing deterioration in relations with the West. In short, both domestic and foreign politics are headwinds for investors. The July meeting of the central bank disappointed markets. Despite both core and headline inflation surprising more than a full percentage point higher, rates were kept on hold and the forward-looking guidance was left unchanged – the optics couldn’t have been much worse given the fresh concerns about the politicization of the central bank. The current account deficit remains above 5% exacerbated by high oil prices and requires slower growth to correct – something Erdogan is unlikely to tolerate. Net foreign-exchange reserves at less than $30bn have dropped to less than 1.5 months of import coverage. FX leverage in the corporate sector has not been growing, but remains very large. The total net open FX position is approximately $230bn. As the lira depreciates this liability is quickly growing. In February, the liability represented around 25% of GDP. Today the liability is closer to 35% of GDP. Fortunately corporates have largely hedged their short-term (less than 1-year) exposure. Even so, the currency’s weakness is exerting major pressure on corporate balance sheets. So far there have been at least 4 large corporates needing to renegotiate their bank loans. Turkey is now in very challenging waters. Our debt sustainability analysis shows the extent of the challenges. In our “Stress Case” scenario we assume the authorities try to muddle through for another year and that growth collapses more than expected by the market. We then assume that corporate defaults worsen, and finally in 2019-2020 the government is forced into recapitalising the banking sector with a $25bn (~5% of estimated 2019 GDP) capital injection. Under this scenario, government debt/GDP rises to 45% by 2021 (from less than 30% in 2017). 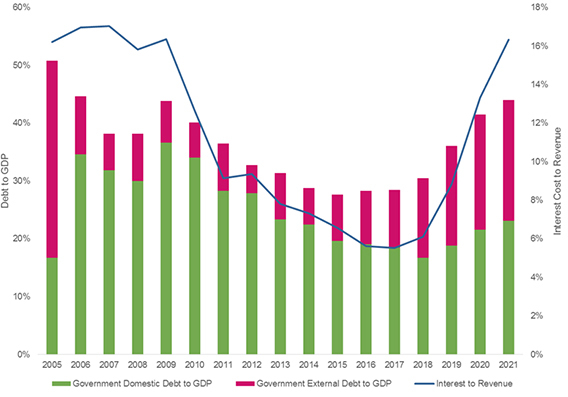 Debt would not stabilise because the government would still be running a primary deficit and interest costs would have risen to around 17% of revenue. What does Turkey need to do to ensure this doesn’t happen? Taken together this would stem local demand for dollars, curb inflation expectations, reaffirm fiscal prudence and bolster investor confidence. However, what Turkey needs, and what the government does, are separate questions. If the government delays and the situation continues to deteriorate, we believe the government may need to source around $50bn to finance a bank bailout, as well as increase FX reserves. As we see it there are perhaps three possible scenarios for how they may try to achieve this. The best outcome is also the least likely: a return to orthodoxy. A deal with the IMF and/or Western governments and institutions to facilitate bank recapitalisation and lessen external vulnerabilities. Such a deal would come with conditions, which would support further structural reforms as we are seeing in a swathe of other emerging markets. Improve relations with the West which would facilitate a rebound in FDI. Hiking rates would still be required, but would likely be more limited in nature and there would be more limited attempts to control fiscal spending. Support from China would likely come in the form of project finance rather than capital injection. We have already seen some Turkish banks seeking out help from Chinese banks to take over government-backed loans for energy and infrastructure projects. Support from Russia or Qatar is also possible but likely to be more limited. Turkey is between a rock and hard place. The authorities have some tough decisions to make, but seem unwilling to recognise the scope of the fragilities or take sufficient steps to address them. Ultimately, the market will impose a reckoning. At some point the value that has opened up might start to look like an attractive entry point, but much will depend on the choices made by the authorities. For now, we remain relatively conservatively positioned across portfolios, preferring opportunities elsewhere in our universe where we see better fundamentals and more constructive policy-making. Previous article Will the renminbi rout continue?